Before I start writing about what the title suggests. I want to make very clear that this is not an attack or criticism on Buddhism. I myself have studied Buddhism to an excessive degree and have taken benefit from its teachings. I also hold Siddharth Guatama, later to become known as the Buddha ("Enlightened One") in high esteem and would put him on the level of prophets (Nabi, not Rasul). The reason I believe such an article is necessary is because I have come across just too many people, colleagues and friends, who have the most skewed and really ignorant understanding of Buddhism, often describing it as something that it is not nor ever will be. The goal of this article is to prove to you that perspective is the only thing that counts. It can turn something ugly into something beautiful. It can make a king look like a pauper. It can make Islam look like a war-mongering religion and Buddhism look like a tranquil lily pond with no interest in worldly affairs whatsoever, least of all fighting (or even God forbid, killing) other human beings. Friend: Hey Abu Fulan, can you give me an intro into what Islam is? Abu Fulan: "Yes, of course, I would be happy to share this with you." Abu Fulan: And that's why you have Muslim extremists, they understand very little about Islam and typically come from the lower classes and lack the proper education. Hence, you have older men who have personal grievances towards the West (and really anything or anyone else) that can mold the minds of these young and angry men, convincing them to commit heinous atrocities all over the world. They convince them that Islam is the ONLY way to God and that all other religions are inherently incorrect and unacceptable in the eyes of God, which is why it is acceptable to kill non-Muslims. Friend: That's why I like Buddhism, they accept everyone and don't limit the correct religion to just Buddhism. They are also very peaceful and don't kill or hurt anyone. Now, as you read through the dialogue above (which really happened, mind you), I hope some red flags went off. If they did not, then you really need to read what follows below. I will spare you the dialogue format and begin a pseudo academic analysis of these two big misconceptions that most people have in the West. Second misconception: Buddhists don't kill people, they are a peaceful people who would rather be killed than kill another person. This is actually more widespread than I initially thought. People in the West know so little about Eastern religions, it's amazing. It's sad, but the only people that really understand the Orient from the Occident that do not belong to an Oriental religion are academics. Which is also very peculiar since they have made it their life's work to understand a specific Oriental religion in and out but don't practice it themselves, yet are considered the foremost authorities on the subject. Doesn't that just sound ignorant? I mean, up until recently, the primary writers and scholars on Islam from the West were overwhelmingly Jews and a smattering of Christians. Now you have Muslim scholars on Islam on the rise in the West, but it's a far cry from what would be ideal for Muslims in the West. Whatever happened to the American ideal of "No taxation without representation!"? Haha, I mean honestly, how are Americans reading books by a Rabbi about Islam and considering it to be the unbiased narrative of the last of the Abrahamic faiths? It's ludicrous. If you are going to read about a religion, read the writings of actual practitioners of that religion. It makes no sense to not do so. Maybe once you have garnered a decent understanding you can branch out to see what others have written. Bah, who cares, no one takes religion seriously any more. Coming back to the first misconception about Buddhism. Now, if you understand religion in general, you have to submit to the fact that each religion thinks it is the end all be all. It is the ONLY religion that is valid and true for all of mankind. We are speaking at the basic level, not the esoteric, that is another discussion. This has to be true, otherwise, what is the point of any religion? Your religion has to be exclusive in this particular way. Otherwise no one will have an inclination to be a part of that religion. People in the West, including my friend, think entirely incorrectly. They consider Buddhism to be some metaphorical lotus flower that encompasses all of mankind indiscriminately. Hahaha, how incorrect they are. The Buddha is our only Master. We take refuge in the Buddha, the Dhamma and the Sangha. We do not believe that this world is created and ruled by a God. Following the example of the Buddha, who is the embodiment of Great Compassion (mahaa-karunaa) and Great Wisdom (mahaa-prajnaa), we consider that the purpose of life is to develop compassion for all living beings without discrimination and to work for their good, happiness, and peace; and to develop wisdom leading to the realization of Ultimate Truth. We accept the Four Noble Truths, nameley Dukkha, the Arising of Dukkha, the Cessation of Dukkha, and the Path leading to the Cessation of Dukkha; and the universal law of cause and effect as taught in the pratiitya-samutpaada (Conditioned Genesis or Dependent Origination). We understand, according to the teaching of the Buddha, that all conditioned things (samskaara) are impermanent (anitya) and dukkha, and that all conditioned and unconditioned things (dharma) are without self (anaatma). We accept the Thirty-seven Qualities conducive to Enlightenment (bodhipaksa-dharma) as different aspects of the Path taught by the Buddha leading to Enlightenment. There are three ways of attaining bodhi or Enlightenment, according to the ability and capacity of each individual: namely as a disciple (sraavaka), as a Pratyeka-Buddha and as a Samyak-sam-Buddha (perfectly and Fully Enlightened Buddha). We accept it as the highest, noblest, and most heroic to follow the career of a Bodhisattva and to become a Samyak-sam-Buddha in order to save others. We admit that in different countries there are differences with regard to the life of Buddhist monks, popular Buddhist beliefs and practices, rites and ceremonies, customs and habits. These external forms and expressions should not be confused with the essential teachings of the Buddha. Now look at the bolded lines above, just reading these are enough to prove that Buddhists do not accept other religions as true. Really all of the points above prove that, but the bolded ones are a little more blatant. Buddhists have their own creed and doctrine, why on Earth would they say that it's okay to be Hindu or Muslim? It doesn't make sense at all. So, that misconception is debunked. I myself was surprised when I first learned about how violent Buddhists can be several years ago. 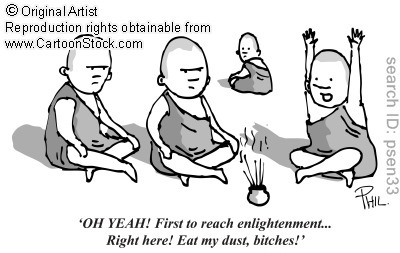 Admittedly, I believed that Buddhists were stubbornly peaceful for the majority of my life. Fortunately, I started reading a lot and came across many articles that point to the contrary. 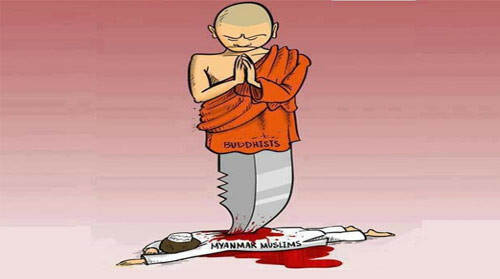 If you haven't been following my news articles on the recent violence enacted by the Buddhists of Myanmar (formerly known as Burma) on the Muslims of Myanmar, please take a look through the News Blog. Growing up I used to watch all these fluffy and sympathy creating films about the plight of Buddhists in China, or rather, in Tibet. I saw the great movie "Seven Years in Tibet" which is about Austrian mountain climbers who after a series of events find themselves living in Tibet for a time. As well as the movie "Kundun" which is about the reincarnation of the 14th Dalai Lama into a young boy. There are so many fanciful movies about Buddhists and the West eats it up, almost as quickly as the Japs slurping down their bowls of Ramen (I actually really like Ramen, not raw men, because that's haram). Coming back to my point, there is just so much good press for Buddhists by Westerners, and sure that's a great thing, the same was true about Islam up until 30 years ago. Most people don't even know that the first country to recognize the sovereignty of the newly established United States of America was a Muslim nation, the Sultanate of Morocco. It was on December 20, 1777, that Morocco formally recognized the colonies that comprised the United States as a unified sovereign nation (Wiki). America's relationship with Islam and Muslims was always really good up until recently. I won't get into the deterioration of this relationship, there are many reasons and that would deserve an entirely different article. Maybe a book, I'm sure there must be several books out there on this topic. If this topic interests you, try to find a good a book about it and then tell me. But the reality of Buddhism non-violence (or lack thereof) is very different from it's nice and fluffy portrayal in the West. The [true] follower of the Mahayana is not the one who observes the five precepts, but the one who uses the sword, bow, arrow, and battle ax to protect the monks who uphold the precepts and who are pure. Killing is part of our creed. My point I believe has been sufficiently made. Which brings me back to my universal point, the only point I am trying to make with this website. Do you know what that point is? The point is that Ignorance is Not Bliss. All of the negative things discussed on this site are the immediate result of individual and communal ignorance. It's not hard to educate oneself on a multitude of topics. We just have to be willing. If you opt for not educating yourself about a specific topic, you should never open your mouth to comment on that topic. The only words that should be coming out of your mouth are: "I don't know." Then perhaps your conversation partner will take the time to educate you, but even then, I wouldn't go around repeating what was said to you unless you verified it for yourself. 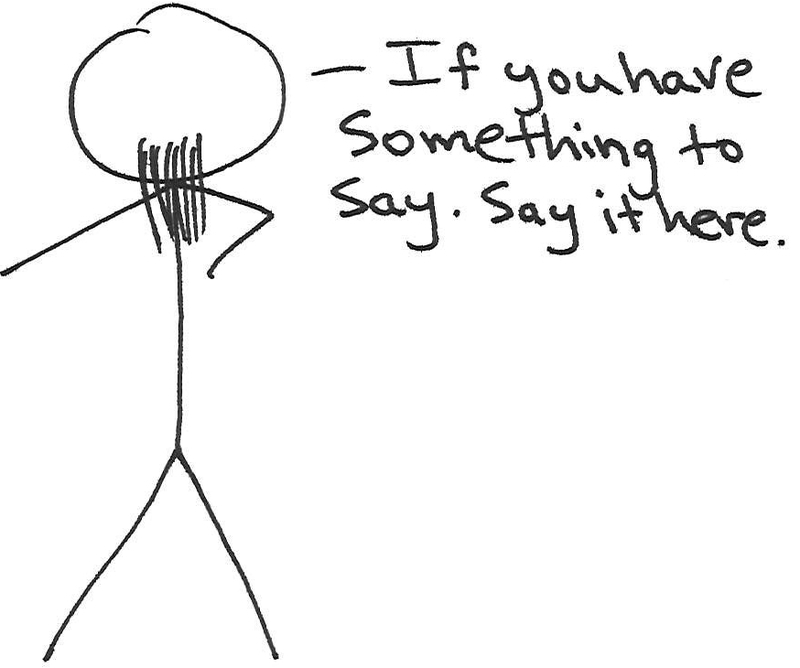 People who often appear incredibly confident are very convincing when they speak, even if it's utter rubbish. A lot of the time it can be just that. So, this is your warning, don't say I didn't warn you.